The stand out metric from the game, when compared to how the game is played currently, is the number of possessions. Over the last four years the average number of possessions per game was 96. This year in the Super8s onwards it was 90. The very highest I have recorded is 116 (both from Dublin in 2015 – against Kerry in the rain in that year’s final and against Longford in Leinster). Here it was 145! That 145 gives a snapshot into how the game was played – including the effect that the rules (see note1) then in effect had. Possession was not as coveted and instead clearing your lines, and contestable balls, were much more de riguer. 52 (36%) of the possessions had just one player on the ball. Throughout the game just seven (5%) possessions involved sequences of six or more passes (Kerry twice had sequences of seven pass). As a point of reference in this year’s final there were 94 possessions in total of which four (4%) had only one player in possession and 31 (33%) had sequences of six passes or more. These high possession volumes have knock on effects on metrics such as Attack Rates, Shot Rates and points per possession. The ratio of turnovers to kickouts is also skewed. So what of the game itself? From the television coverage there appeared to be quite a strong wind which is borne out by the fact that 3 – 14 of the 4 – 20 scored was into the Hill16 end. Kerry played into that end in the first half and opened up a sizeable lead that Dublin sought to furiously claw back. The time series chart above shows how Kerry got ahead early. This was achieved through both their excellent shooting (82% conversion rate (1 – 08 from 11) & +3.40 Expt Pts) in the first half and also Dublin’s very poor shooting (20%; 0 – 02 from 10 & -3.53pts). Kerry had a lead of 0- 09 despite only having one more shot. Had both teams converted their chances at modern rates (see note2) the lead would have been 0 – 03. The fact that Dublin were always in the game, despite the scoreboard, is highlighted by the fact that the two teams Expt Pts crossed somewhere around the 40th minute. Dublin created the chances – they just were nowhere near as clinical as Kerry. As has been touched on both teams’ use of the ball was of the time so Attack and Shot Rates are much lower than we are used to. That said however Kerry’s shooting was as good and efficient as any team in the modern era with a 64% Conversion Rate and Expt Pts of +2.63. Kerry struggled to get shots off but when they did they were excellent ably led by Jack O’Shea & Pat Spillane who combined for 1 – 06 from just 9 shots. Kerry they had four shots at goal returning 2 – 01 (Timmy O’Dowd’s only two shots in the game were both at goal!) whilst also returning 57% on all point attempts (0 – 08 from 14; Expt Pts of +1.83). Looking at the shot chart in the Appendix there was only really one long range or wide effort – from Eoin Bomber Liston at the end of the first half – which really helped their returns. Bomber only had that shot in the game but he was immense for Kerry overall moving out to the middle third to shore that area up but also being involved in Kerry’s link play providing five main assists and also being involved in two other shots. Next on the assist chart was Ambrose O’Donovan who was involved in the set up for three point attempts and also being involved in the build up to both of O’Dowd’s goal attempts. Dublin manufactured six more shots than Kerry but the majority of that was through deadballs (eight shots at goal from frees plus one 45 as against four frees from Kerry). Given that all frees were taken from the ground there was a bit of subjectivity overlaid on all the above shots in yellow to satae that they were indeed shots but … Rock struggled on the day converting just 38% (0 – 03 from 8). Duff missed the sole 45. Point taking was also poor. Dublin attempted 16 point attempts returning just 0 – 05 (Expt Pts -2.21). Their “outside” shooting was fine retuning 0 – 03 from 6 with John Kearns popping over two fine efforts in the second half – one out on the defence’s right at 60 minutes and another from ~40m just right of the D. It was their “inside” shooting that let them down returning just 0 – 02 from 10 attempts with 0 – 01 from 6 in the first half when Kerry jumped out into their lead. 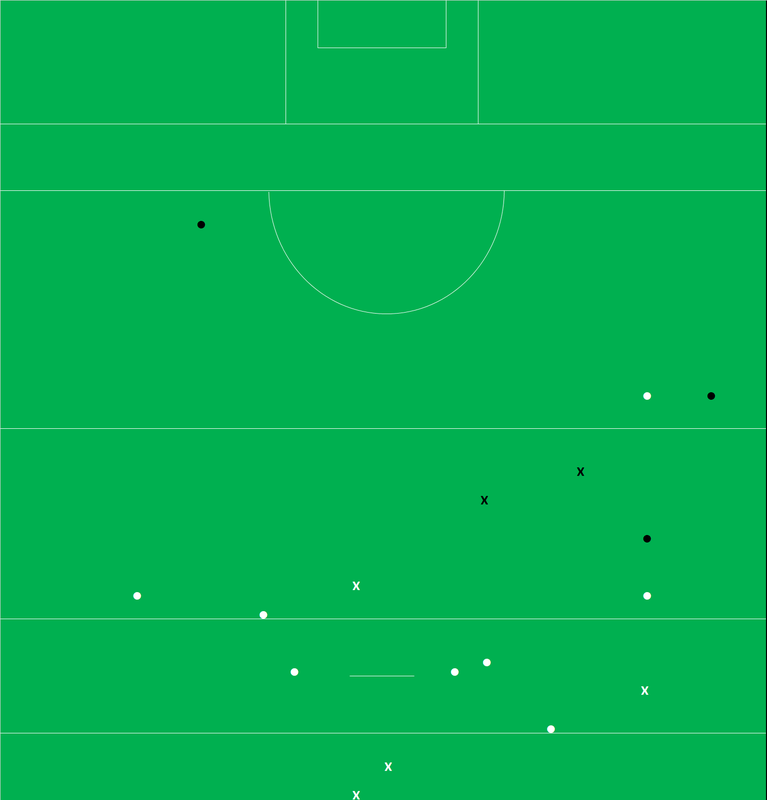 One noteworthy point was the fact that only six Dublin players attempted a shot throughout the game and only five from play (all of Barney Rock’s attempts were from frees). All six were their designated forwards (Tom Carr being a direct replacement for Charlie Redmond). Nothing, in terms of shots, came from their midfield back (see note3). The make-up of kickouts in 1985 was very different than today with just 7 (19%) of the 37 kickouts taken going short. Indeed of those the TV cameras picked up only three kickouts were “deliberately” short or clipped out to a player. Of those taken after a wide (see note1), and thus from the small square, the kickout team won the possession battle 8 – 7. Similarly when the ball was placed on the 20m line, after a score, the kickout team won possession 11 – 10. There was no discernible difference in whether the kickout team won the ball depending on where the kickout was taken from. When we look at it by team however there is a difference. Dublin had 19 kickouts with 4 going short. Of the remainder (those that went past the 45m) Dublin won 53% (8 – 7) however when the kick went longer, after being placed on the 20m line, Dublin won 64% (7 – 4). Kerry were able to attack the kickouts from the small square that went past the 45 getting their hands on 3 of 4. There was also something about O’Leary’s trajectory as none of his kicks were claimed through a clean catch. Kerry on the other hand struggled. They claimed both of their own kickouts that went short however on their longer ones they lost the possession battle 6 – 10. Given the small sample size there was no discernible trend on those taken from the small square (lost 3 – 4) as opposed to those taken from 20m line (3 – 6). Again we have to be careful overlaying modern sensibilities on the game (but are going to do it anyway!) however Dublin must have been disappointed with their return here. They were on top of Kerry’s kickouts but only produced 2 shots and 0 – 01 from the ten they won. Kerry scored 0 – 02 of the seven Dublin kickouts they won. • Differing kickout positions depending on whether you are taking a kickout after a score (thus from the 20m line) or from a wide (thus from the small square). Note 2; We may be doing these historic games, and thus their participants, a disservice by comparing their accuracy to current regimes given the differences in the ball (heaviness) and much surer underfoot conditions in the modern game but it may also be instructive. Note3; Kerry had eight different shooters. Again all six forwards (John Kennedy as a direct replacement for Ger Power had one shot – Power didn’t have a shot in the game) as well as Jack O’Shea and Tommy Doyle. Let alone score Doyle was thus the only back in the entire game to attempt a shot. 11 games covered which equates to 22 returns – of which Galway have the three performances with the least amount of possessions. Not just the three lowest though – their two games against Donegal and Mayo are a full six possessions lower than the next lowest recorded by any other team. Intriguingly it is not that they are completely slowing games down and “dragging” the opposition down with them. They have easily lost the possession battle in all three games; by totals of 6 (v Kerry), 7 (v Mayo) and 8 (v Donegal). That impression you have of Dublin dominating possession? Yeah it is not merely an impression. Of all team possessions with 20 or more player possessions (essentially player touches or strings of passing) Dublin have six of the top 11 and are the only team to top 30 player possessions in the one move. Perhaps surprisingly Dublin are not the most prolific offensive team in terms of output. They are below the average in the number of shots per game and shots per possession they attempt. What they lack for in quantity they more than make up for in quality however. They have a wonderfully high Conversion Rate on the shots they do take. Alloy this Conversion Rate, with the high volume of possessions, and you get your high scores. 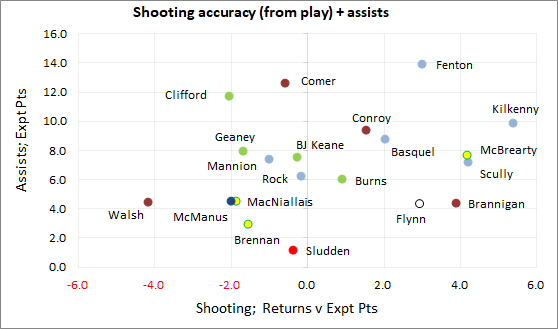 Galway are highly proficient when they attack (high shots per possessions and Conversion Rate) but as noted above their (current) weakness could be the inability to create enough shots, through low possession counts, should the radar be off. Donegal are shooting from everywhere with near on 30 shots per game – but their relatively low Conversion Rate is indicative of the fact that a lot of these are from “outside” the shooting zone. Kerry’s new forward unit with O’Sé, Burns & Clifford are chugging along nicely whilst Mayo are struggling. The above table shows all players with at least 8 shots from play (see NOTE2). Brannigan is currently on fire scoring 2 – 06 from his 10 shots as is McBrearty’s left peg (all 13 shots are point attempts with the left). Noticeable how these two are then followed by a squadron of Dublin attackers. 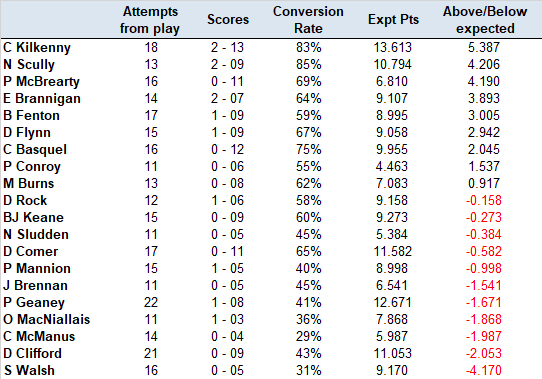 This is to be somewhat expected given Dublin’s 65% Conversion Rate as a whole but it is still striking when you see that they have five of the top7 shooters by Expt Pts. So this is new. I have started to track assists as another tool to view the front 8. This is somewhat subjective as a number of shots will come from players themselves making the breakthrough thus not producing an assist; or a defender might foul the ball thus providing the opposition with a shot from a free (does the player who induced the foul get an assist? ); or the last pass may be an incidental popped hand pass (see NOTE3). As with any new metric there’ll have to be an element of trust on this one! The above chart shows the shooting/assist Expt Pts interplay for those players listed previously with at least 8 shots from play. Where you want to be is in the top right quadrant (highlighted by the green circle) with a high positive Expt Pts for shooting (thus being very accurate) and a high Expt Pts for assists (thus showing a high level of attacking involvement). Can we consider Fenton a midfielder? These offensive numbers are off the chart – high volume of shots, with high accuracy and high assists production. On his assists he has won three frees that led to Dean Rock attempts at goal, set up Kilkenny for his goal against Tyrone and also provided the assist for seven point attempts. Phenomenal. 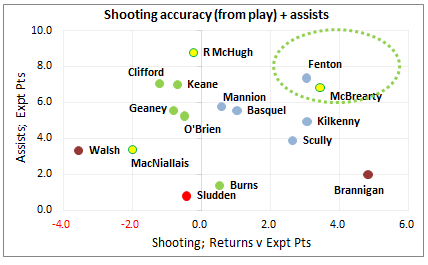 McBrearty has two less assists than Fenton (9 v 11); he also has won three frees (that he himself took) but has set up two goal attempts and four point attempts. Given his accuracy from play (0 – 09 from 13 point attempts) and the fact that he is Donegal’s main free taker (0 – 17 from 20; 85% Conversion Rate and +0.8 Expt Pts) it is some feat to also be so high on the assist chart. He is a very different player to Fenton but currently no less phenomenal. The only problem with the first chart is that it hides the “non shooters”. 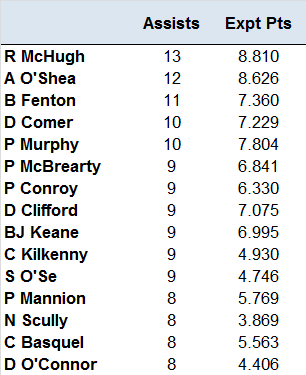 Purely listing by the volume of assists we see the likes of A O’Shea, P Conroy and S O’Sé start to rise to the top. Again perhaps surprisingly Dublin do not show up as best in class here. They allow more shots per possession than anyone else which, allied to their more open games, leads to more shots allowed per game than anyone else. What is noticeable however is the low quality of the opposition’s shooting (Conversion Rate at a very low 45%). This low Conversion Rate can undoubtedly be attributed to excellent defending (more pressure on the shooter and/or teams taking shots from less favourable positions) but there must also be a mental aspect to this – teams forcing attempts knowing they have to keep up. The argument against this is perhaps Galway. Their defensive numbers are very similar to Dublin’s yet it would be hard to argue that teams are under the same mental pressure when facing Galway as they are when facing Dublin. I would contend however that Galway defend differently – tighter, more aggressive – and it is this that gives them the same defensive edge that Dublin seem to gain from their opponent’s mentality. Still it is definitely something worth looking at after the league – do teams shoot differently against Dublin as opposed to against anyone else? On the offensive summary we commented on Kerry & Donegal’s higher numbers which was a nod to the fact that they had a good balance in attack (Kerry) or a defined game plan (Donegal could be deemed “shoot on sight”). They are both struggling on the back end however. When looking at these tables it is again important to reference NOTE1 below – any changes may be as a consequence of natural differences between league and Championship rather than wholly attributable to the changes in the kickout rules. Having said that there has definitely been a change in kickouts with the proportion of kickouts going short (landing inside the 45m line) dropping from 48% in the 2017 Championship to 37% this league campaign. That’s dramatic enough and the sample size – at 28% of the 2017 Championship games – is representative. Come the end of the league we can expect the proportion of short kickouts to have dropped by c10%. We have seen Marks increase but not to any great degree. Instead we are back to the future where breaking ball is becoming more important. I define such kickouts as “contestable” (outside the 45m line and not claimed through a Mark – see NOTE4). Kickout teams have increased the proportion of “contestable” kickouts they win but in both the 2017 Championship & 2018 League campaigns teams only manage to win c50% of their own “contestable” kickouts. Galway weren’t as fond of the short kickout as others in 2017 but have almost eschewed it completely so far with only 14% going short (remember the average is 38%). Given that the kickout team gets the ball ~95% of the time when it goes short this also explains why they are losing the possession battle as noted earlier (as does the fact that they are below average in winning their own “contestable” kickouts). Donegal’s drop off is as pronounced (60% of kickouts in 2017 Championship went short versus 25% in the 2018 League) however this could be attributed to a change in philosophy under Declan Bonnar as much as anything else. Dublin’s short ones have dropped off completely (66% in ’17 down to 44% thus far) – getting ready for the Summer perhaps when they expect a high press from the opposition? Also noticeable that despite their athleticism, and Cluxton’s radar like aim, they are only average on “contestable” kickouts. Mayo & Kerry appear to have completely ignored the new rule (playing possum and not showing their Summer hand?). Kerry have been very good on their own kickout claiming a high of 69% of their own “contestable” kickouts. Where there are comparisons to 2017 Championship numbers it is worth noting that we have no real previous comparisons between League and Championship campaigns. There has always been the sense that the League will be different but we just don’t know (I have been particularly lazy in not doing league campaigns before!). This point, that there may be a natural difference between League & Championship, is particularly important when we come to kickouts as we have the additional overlay of the new kickout rules. Just because numbers change here does not mean it is as a direct result of the law changes – there may also be a natural difference between League & Championship outputs. Note3; I have ~84% of shots not having an assist. Note4; acknowledging that not all kickouts past the 45m line are contested – nor indeed that all Marks are un-contested. Still – it’s an easy label. For the uninitiated Expt Wins uses bookmaker’s odds (note 1), as a sort of independent arbiter, to see which teams over (or under!) performed versus what was expected on a game by game basis. It is a much better fairer view than sheer win percentages given (a) how relatively short the season is for most teams and (b) how uneven the Championship can be in terms of the quality of teams facing off against each other. Unsurprisingly the top10 is peppered with teams that were promoted. This makes sense as for the majority of teams the league makes up at least two thirds of their season. Carlow had an excellent season – but it was no fluke; they were also top5 in 2016. Over the past two seasons they have won 11 games when they were only expected to win ~7.7. And they managed to top the 2017 table despite losing as 1/16 home favourites against London. 1/16, without accounting for the bookmaker’s margin (see note1), implies a 94% win probability. Win that game and their “above Expt Wins” total would be twice that of second placed Louth. That loss is the shortest price loss in the database and must be one they desperately want back. There is no guarantee that Carlow would have gained promotion had they beaten London – as Wexford no doubt would have put greater emphasis on their final two games – but they must be absolutely kicking themselves every time they think of that game. And yet – they still topped the 2017 table despite this loss. Now I am by no means an expert on the ins and outs of Louth football – and you have to think they have a good ‘un in Pete McGrath – but you have to feel for Colin Kelly. Back to back promotions. A 59% win rate over that period which lands them 5th on that metric behind the likes of Dublin, Tyrone, Kerry and Kildare (themselves aided by back to back promotions) and along with Carlow the only team to finish in the top5 Expt wins both years. The two Championship campaigns were poor in comparison (played 6 won 3 with three loses of 4, 6 and 9 when stepping up against Derry and Meath) but still … be careful what you wish for. In 2016 Tyrone and Cavan were in the top10 following successful promotions from Division2 and the trend holds true for Galway and Kildare. Division2 is always very tight – just under half (27 of 56) of all games in the last two years had a zero or one point handicap. Extend that to two points and 80% of the games are covered. Win enough games to gain promotion in these tight contests and you are well on your way to outperforming expectations for the season. 1. The worst team in 2017 was (subjectively) Wicklow but no matter how bad you are when you play your peers in the league you are always given “some” chance. Wicklow’s seven league appearances saw them chalked up at odds of 8/11, 3/1, 5/6, 10/3, 11/2, 6/5 and 6/1. When we remove the bookmaker’s margin that equates to an expectation of two wins. And that’s for the “worst team”. Limerick’s odds were 8/13, 11/10, 13/8, 1/10, 8/15, 11/8 and 1/10 which comes out at just over four wins. No matter how poorly you are viewed under Expt Wins you will always be expected to notch up at least two wins and maybe four or five … if you struggle to win games full stop you will always be down the bottom end of this table. 4. Cork. Ah Cork. For the second year in a row they appear in the bottom5 but can you imagine how poor they would look had Waterford managed to tack on one more point when Cork were 1/50? Cork were middle of the pack on win ratio (winning 41% of their games) but were overturned by Tipperary as a 7 point favourite in the 2016 Championship whilst also losing at odds of 1/3, 4/11 and 4/11 over the two league campaigns. They never won a game as underdog to balance these losses. Although there are outliers – notably Carlow, Louth and Cork – I would lean towards no. There is just too much volatility as teams yo-yo up and down the table; Kerry from 27th in 2015 to equal 6th in 2016 and then back down to 28th in 2017; Cavan from 9th to 31st, Armagh from 32nd to 5th. Good luck trying to pick which of this year’s top5 will stay there! All odds are taken from Paddy Power and tend to be taken towards the back end of the week (Friday night/Saturday morning) to let any movements settle down. It is possible that injury news etc. changes the odds between what was taken and what they were at throw in but I’m comfortable enough that this would be a rare enough occurrence not to have too big an impact. Styles make fights. It’s an old adage but one that has endured because there is such an element of truth in it. How else to explain away how a game between two teams differs so much from one week to the next. In the drawn tie there were a total of 103 possessions with 47 turnovers. Kerry won the possession battle 54 – 49. Here there was a total of 87 possessions – with Mayo winning that battle 47 to 40 – and 31 turnovers. There was just 9 (9!!) turnovers in the first 35 minutes. There are many minor elements throughout a game that will lead to such variances but the main variable that changes was in how Kerry set up. They started with an extra man back to cut off the kicked ball into Mayo’s forwards. The knock effect of this was that (a) Mayo’s kickouts were less frantic and (b) Mayo countered by playing more of a possession game. Both elements ensuring there were less turnovers. More on the kickouts later but to my mind Mayo showed their collective football intelligence by changing their style to suit the additional element of Kerry playing one back. They played a game we don’t normally associate with them – keep ball. In the drawn game they had just the four (8% of all possessions) team possessions where there were at least 12 player possessions. Only one occurred in the first half of that game. In the replay that rose to eight (17%) with five in the first half. Now 12 is an arbitrary number used to illustrate a point but that point is further bolstered by the fact that in the seven games prior to the semi-final that percentage (of team possessions with >12 player touches) was just over 8%. Mayo changed their natural game to play what was in front of them. And executed it with intelligence and no small degree of precision. A very clinical outing from Mayo scoring 0 -04 more than would have been expected from the shots they attempted. From an Expt Pts perspective the majority of the gains came from their goal attempts where three shots produced 2 – 00. 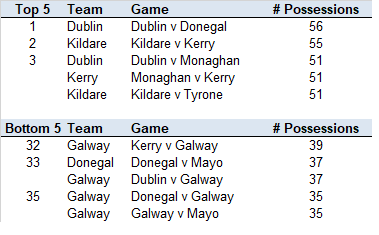 Over the two games Mayo had eight shots on goal scoring 4 – 01 with an Expt Pts of +3.22 (Note; Expt Pts is less reliable on goal attempts than point attempts – as will be seen when we come onto Kerry). Even if they don’t manage to maintain the same high conversion rate Mayo will want to carry the volume of attempts through to the final as this was a weakness against Dublin last year. Over the 140 minutes of the replay and drawn game against Dublin they only manufactured three shots at goal returning 1- 01. 25% off a very low volume (0 – 01 from four; free x3 & 1 x 45) whilst his returns for the year badly lagged previous seasons (67% Success Rate & Expt Pts of -3.87). Here he was 0 – 06 from seven attempts (86%) though with an Expt Pts return of +0.19 he would have been expected to score 0 – 06. His one missed attempt was again outside his range in being a 45 to the left of centre. Jason Doherty’s two points (0 – 02 from 2; Expt Pts +0.66) were excellent – especially the first free from the left as Kerry had reduced the gap to four points at that stage by scoring the previous two and would have gotten a huge lift if Mayo had missed an opportunity through their main free taker being off the field. Given O’Connor’s long distance travails the consummate ease with which he converted the second attempt, a 45, might give Mayo management a decision to make on the longer ones come the final. In the drawn game Mayo’s point attempts were very good returning 52% (0 – 12 from 23; Expt Pts +1.03). They stepped back ever so slightly here returning 50% (0 – 08 from 16; Expt Pts of +0.78) but not to any degree that would be alarming. Although their shooting form has waxed and waned throughout the campaign, and indeed throughout certain games, they have been very consistent at a macro level. In the seven games coming into the semi-final they were converting point attempts at a 49% clip (Combined Expt Pts of -0.40). In the two SFs here they were a combined 51% (Ext Pts of +1.83). In the final they will be looking to hold onto this 50% as a minimum – over the 140 minutes against Dublin last year they were 45% (0 – 14 from 31; Expt Pts -0.22). Marginal gains and all but … that uplift from 45% to 51% could be the difference in a one point defeat over 140 minutes and a one point victory in 70 minutes. Kerry’s numbers are an absolute contradiction with a very high conversion rate at 59% but a horrible Expt Pts of -5.29. The negative Expt Pts can be entirely explained through their goal attempts. They had four separate instances where they were through on goal, producing six shots, but came away empty handed. Of the six only Peter Crowley’s attempt – immediately after Mayo’s first goal – could be considered anyway clear cut. Geaney’s movement, in such a confined space, was nothing short of remarkable for the attempt that Boyle stopped on the line but it was far from what could be described as a “gilt edged” opportunity. Similarly the three attempts around the 45th minute that Clarke, and a plethora of defenders, kept out were, in the main, instinctive snap shots. Geaney had another attempt from out wide at the death but there again there was a whole host of Mayo bodies in the way. Leaving the goal attempts to one side Kerry were an incredible 74% (0 – 17 from 23; Expt Pts +1.97) on the remainder of the shots. We have seen that Mayo – on a combined 51% – had a combined Expt Pt close to Kerry’s with a 74% Success Rate. How so? Kerry achieved their 74% on very simple shots. The complete shot chart is in the appendix but below are all their 2nd half attempts – it comprises of goal attempts, tap overs and simple frees. There is only one shot from outside ~25metres. They went for goal too soon and too often. Kerry struggled collectively the last day on their point taking (40%; 0 – 08 from 20) but coming into the semi-final they were on fire with a combined 71%. Yes the defences they faced were of a lesser variety than Mayo’s but they really should have been in a position to back themselves and keep the scoreboard ticking over. 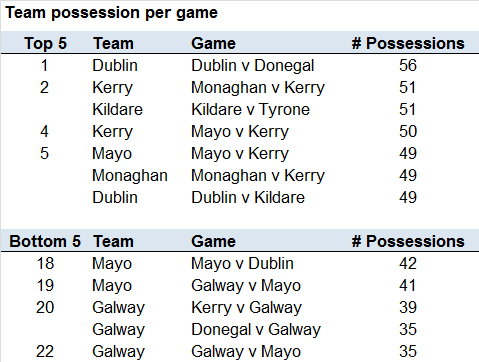 Mayo (when compared with the outputs from the drawn game) wiped the floor with Kerry. They got 15 of their 23 kickouts away short with, unlike in the drawn game, quite a number coming under little or no pressure. That first game saw them score 1 – 06 from the 13 short ones that they won. They were less productive here scoring “just” the 0 – 04 on their own short kickouts but where they really dominated was on the mid/long range. In total there were 19 kickouts that went past the 45 – with Mayo winning 13 (six on their own kickout to just one for Kerry and seven on Kerry’s kickout to just the five for Kerry). And when they won them they went for the jugular getting nine shots off and scoring 1 – 05. That’s 1 – 09 from kickouts both days. Why the turnaround? It is very hard to say watching TV footage but there appears to have been a convergence of Kerry getting caught between roles following their decision to play with an extra back plus Mayo going back to brass tacks (if you get a chance to re-watch Peter Canavan’s piece on Sky on how simple some of the “bunched” routines were it is well worth it). One area that might give Mayo something to ponder is the fact that Kerry moved the ball quite well from their own short kickouts. 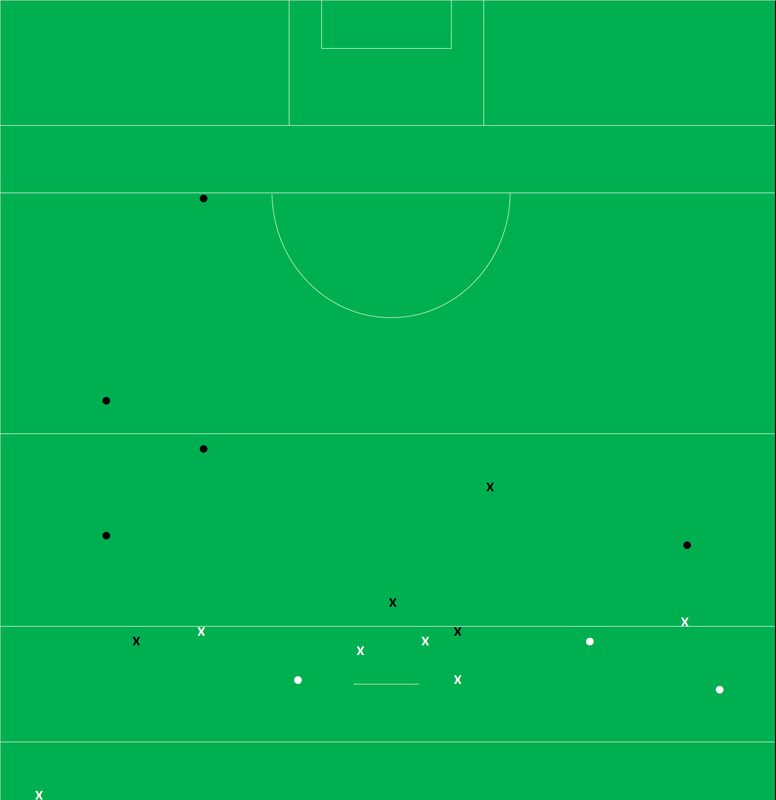 Kerry won 11 converting eight to shots and scoring 0 – 06. Or 0.55 points per kickout won. In fairness this appears to be a blip as Mayo were giving up 0.28 points per short kickout in the prior eight games this year but still there are always those edges to be gained …. Coming into the game one of the biggest disparities was in Kerry’s Conversion Rate versus what Mayo had allowed up to that point. In their three 2017 Championship games Kerry were running at a massively impressive 67% clip (both on total shots attempted as well as on point attempts from play) whilst Mayo were giving up 49% (a meagre 39% from play). Something had to give. Kerry ended up with 2-14, a Conversion Rate of 50% and an Expt Pts tally of +0.37; not often you would consider letting in 2-14 a good result but Kerry’s returns were essentially average. On top of the overall lower conversion rate Kerry only hit 40% (0 – 08 from 20) on their point attempts. Advantage Mayo’s defence. 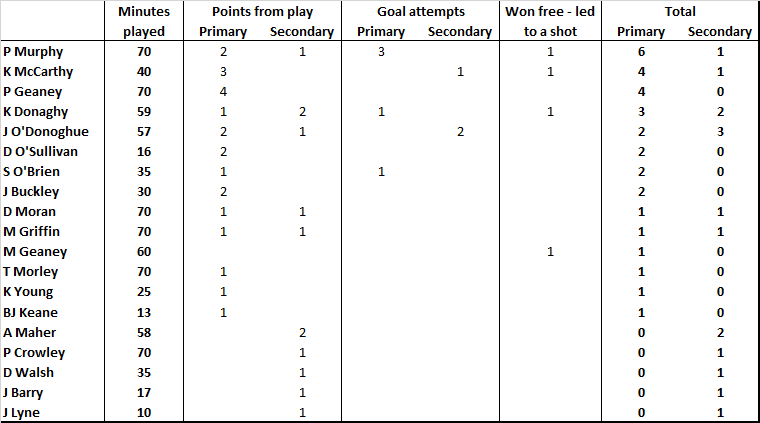 Mayo did however give up eight shots from frees whilst Kerry created three clear cut goal opportunities (three shots on goal and Buckley’s converted follow up). So maybe more of an honourable draw with Mayo shading it. Again coming into the game P Geaney & J O’Donoghue were the Kerry forwards’ standard bearers taking 40% of Kerry’s point attempts with a combined 64% Conversion Rate (Expt Pts of +4.44). Mayo managed to keep a lid on them as together Geaney & O’Donoghue “only” accounted for 30% of Kerry’s point attempts though their accuracy was as good as ever (0 – 04 from 6; 67% Conversion Rate & Expt pts of +1.44). That “keeping a lid” does come with a qualifier however; 0 – 03 came directly from frees where either were fouled. There is plenty of commentary on the merit or otherwise of placing A O’Shea on Donaghy. Looking purely at the figures coming into the game Donaghy had taken just three shots in 124 minutes of action – scoring 1-2 mind – whilst also having eight primary and three secondary assists. Here in just over 70 minutes he scored just 0 – 01 but managed three shots and as can be seen from the assists table below he was Kerry’s puppet master with six primary and two secondary assists. Undoubtedly the three shots were from less productive areas as Donaghy roamed given that Kerry had switched away from the high ball – but that is a minimal gain. Donaghy had a hand in all three goal opportunities and was the dominant Kerry presence in the forwards. Moran & O’Connor’s accuracy up front was excellent scoring 0 – 07 from 8 point attempts (88% Conversion Rate with an Expt Pts of +3.21) whilst overall, when including goal chances, they produced a combined 75% Conversion Rate (1 – 08 from 12) and Expt Pts of +2.37. You will go a long way to find better returns from a front two in such a big game. Of course (there’s always a caveat!) if O’Connor & Moran were sublime, but Mayo were more or less bang on average, that means that there were issues elsewhere. The most noticeable was their deadball accuracy. They had three frees and one 45 with O’Connor only converting 1. This is – worryingly for Mayo – now becoming a trend. 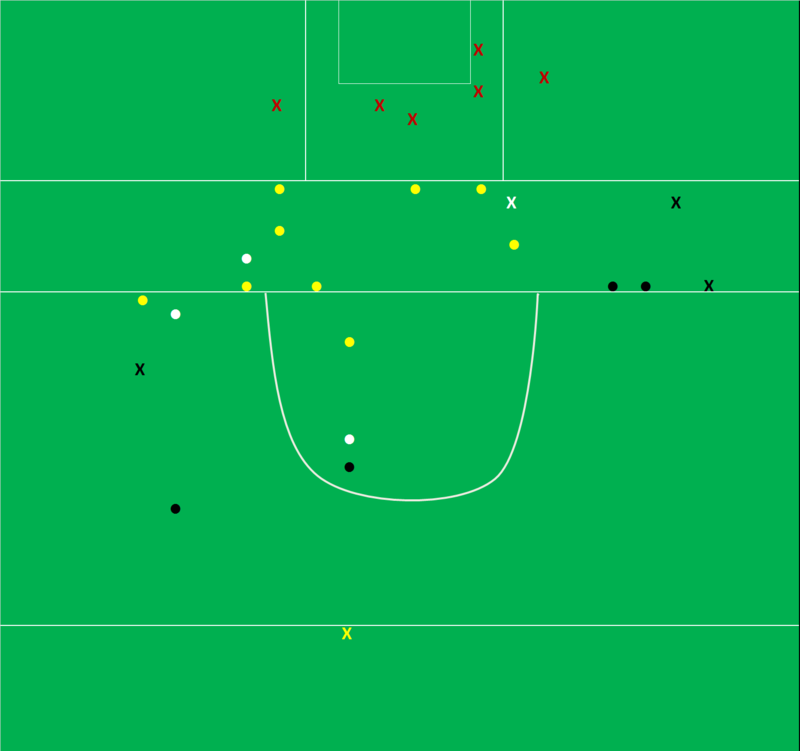 Attached are all O’Connor’s deadball attempts this year with the ones in the Kerry game highlighted in black. Previously we highlighted that O’Connor has a definite arc outside of which he is vulnerable. That arc is as evident in 2017 as it ever was. Outside of Moran & O’Connor Mayo were 33% (0- 05 from 15; Expt Pts of -2.18) which is well down on how they were doing coming into the game (49% & an Expt Pts +0.97). It is hard to see Moran & O’Connor being as productive the next day but even if they do “slack” somewhat the expectation is that the rest of the team will improve. As already intimated Mayo will need more from the supporting cast from play whilst also getting more than just 0 – 01 from whatever deadballs they have. But there’s also the issue of their discipline. They gave up the eight shots from frees but some of those were, to use a technical term, just dumb – especially in the first half. After going ahead by 1 -01 they gave up an off the ball free just outside the D and then managed to give up an extra 13m for a free out towards the wing that brought the ball right onto the D. Two simple tap overs, lead halved and Kerry were up and running. This doesn’t account for the one where Vaughan dived at O’Donoghue’s feet from behind. As an aside this is not the first time that 13m was tagged on to an important free – the equalising score for Cork came from a free just outside the 45 that had had 13m tagged on. Gotta cut out the dumb sh*t in the replay. Kerry? They will be disappointed in their shooting. Dropping from 67% on point attempts in the three previous games to 40% here can be somewhat accounted for by the conditions and the step up in defensive quality however quite a bit of the drop can be credited to Kerry themselves. Of their 20 point attempts 45% were taken under little or no pressure (white in the above chart) with just a 33% Conversion Rate. The three converted were by P Geaney, BJ Keane and K Young (with his right!!) but it was the ones that were missed (Moran & Donaghy x2, Maher & Morley x1) that Kerry will need to tighten up on. The main focus during the game was on Mayo’s kickouts where Kerry applied huge amounts of pressure pushing up on the short ones in an effort to force Mayo to go longer. When Clarke did have to go longer Kerry lorded it winning 8 of 11 (73%) that passed the 45. But the reason for Kerry pushing up so hard was evident in what Mayo did with the short ones they won. Of the 13 they got away they managed to get ten attacks, eight shots and scored 1- 06. Unbelievable returns. Playing the short one as much as Mayo do – 109 so far in their eight games – they’ll always run the gauntlet of the calamitous one. Kerry got a point from the one short kickout they intercepted; to date Mayo have lost 9 (8% of all short kickouts taken) and given up 0 – 07. A goal will eventually come but the credit balance is such that Mayo really should just accept when it happens (though doing everything in their power to prevent it) and stick to the plan. Less newsworthy in the post-game reaction was how good Mayo were on Kerry’s kickouts. When Kerry went past the 45 Mayo essentially broke even (Kerry won 7 getting 5 shots; Mayo won 6 getting 4 shots from same) but they were more impressive in what they did to Kerry’s short ones. Kerry had 11 but only converted three to a shot. At a macro level both teams recorded very similar numbers in terms of Attack & Shot Rate. Kerry had 6 more possessions (in the main from shots recovered & the throw-ins) but only ended up with one more shot. It was Kerry’s clinical finishing that saw then coast to victory. If you’re explaining you’re losing … but the fact that Cork have a higher Expt Pts tally despite an 11 point beating takes some explaining. There are two elements to this; the first is the 11 point gap which relates directly to the conversion rate of both teams. We’ll touch on that later. The second is the composition of the shots that allowed Cork to accumulate more Expt Pts. Both teams had 4 attempts at goal. 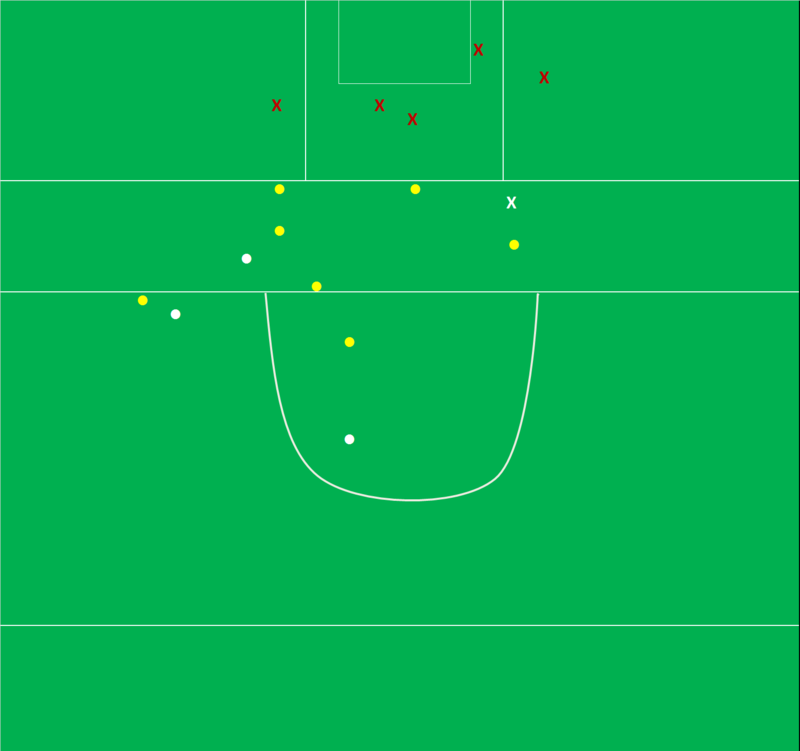 Cork had a further 26 point attempts to Kerry’s 27 however within that 26 were 10 deadballs and 16 attempts from play. Kerry had 6 deadballs and 21 point attempts. 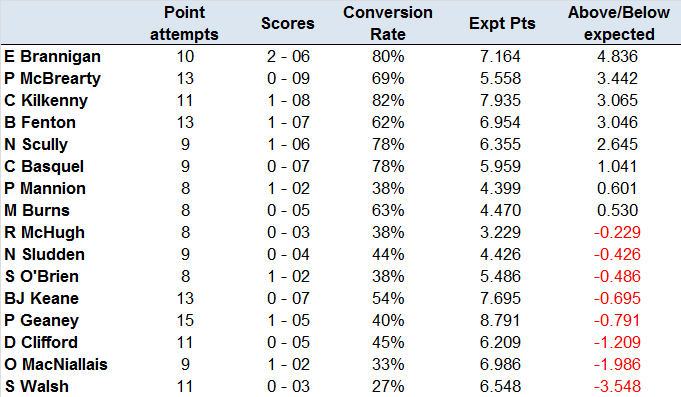 Deadball attempts are converted at a much higher rate than point attempts thus the gap in Expt Pts between the deadballs (Cork’s 10 = 8.23, Kerry’s 6 = 4.51) is such that it overcomes the gap in Expt Pts for the point attempts (Cork’s 16 = 7.76, Kerry’s 21 = 10.06). And that’s how Cork ended up with more Expt Pts. As stated Kerry had 4 shots at goal scoring 1- 00. Which is slightly below expected. Their deadballs were flawless scoring 0 – 06 from 6. What stands apart however was their point taking where they manufactured an obscene Conversion Rate of 81% (0 – 17 from 21; Expt Pts +6.94). It was their 14th point attempt – in the 41st minute – before they failed to convert one. They are simply magnificent returns. For some context the average Conversion Rate from 2012 – 2016 was 46%. Dublin, in their drubbing of Westmeath, converted 76% (0 – 22 from 29). Much has been made of Paul Geaney & James O’Donoghue’s prowess together (I believe it was the Examiner’s John Fogarty (@JohnFogartyIrl) who highlighted the fact that they’ve scored 5 – 58 from play when paired together in 11 Championship games) but what struck me was the supporting cast. Cork’s defence aided Kerry in their endeavours in that 57% (12 of the 21) of the point attempts were taken under little or no pressure. Whilst this intuitively seems high it is a new metric and we need to be careful about reading too much into it. In the above Westmeath rout 66% of Dublin’s shots were taken under little or no pressure. By the end of the year 57% will probably be on the high side but not ridiculous. Speaking of new metrics I have started to track shot assists throughout a game. It is still raw, and subjective, but essentially looks to track those placing the bullet in the chamber for others, in this instance Geaney & O’Donoghue, to pull the trigger. Given how quickly the ball is let into the full forward line it is no surprise to see the front three feature heavily here. What is surprising perhaps are Paul Murphy’s returns. Not surprising in the sense that he’s not capable of such a performance but more so in that he didn’t appear to feature prominently when watching the game live. He very quietly, and very efficiently, pulled the strings. What of Cork? First the positives – they did create the four goal chances. Yes they only returned 0 – 01 but they did open Kerry up. Their deadballs were – as has been the case with Cork – more or less on point (0 – 08 from 10; Expt Pts of -0.23. Essentially average). In a game where the majority of the commentary has referenced Kerry’s forward play Cork managed 30 shots. What failed them was (a) the aforementioned inability to slow Kerry’s shooters. Yes Kerry were on fire but they needed to place them under more pressure. And (b) their own shooting. They had 16 points attempts from play but only scored 0 – 06 (38%; Expt Pts of -1.76). Not only was it anaemic when compared to Kerry but it was well below the average. What might be more damning than the returns is who was shooting. Outside Donncha O’Connor, who came on at half time only Mark Collins got more than one shot off. Kerrigan, Connolly, Coakley, Deane, K O’Driscoll and Hurley all only managed one shot each. Kerry came out on top of the kickouts that crossed the 45 winning 61% (20 to Cork’s 13). From a “must clean up” perspective they will be unhappy that they only manufactured three shots from 9 of their own kickouts that went past the 45. They also lost two short ones when Cork pushed up. Symptomatic of their day Cork didn’t score off either but those instances could be devastating hammer blows in any other game. Normally we look at the game as a whole however this one ebbed and flowed to such an extent that it may be better to review how both teams did within the various segments that made up the game. Colm Cooper and Donnchadh Walsh both missed close in chances early on – Cooper pulling an attempt on the spin whilst Walsh was off balance after a thunderous shoulder from Byrne – which put them in a hole both in terms of the match and their shooting returns (as both were from the zone immediately in front of goal Kerry’s Expt Pts were -1.50 by the 3rd minute!). They then went ten minutes without another shot by which time Dublin had scored 0 – 04 from eight point attempts (shooting was average here with an Expt Pts of +0.26) whilst McMahon also missed Dublin’s only goal chance. As an aside Kerry are only the second team since the start of the 2012 Championship to restrict Dublin to just one shot at goal in a game. The other, somewhat surprisingly, was Meath in this year’s Leinster Championship. We then had a period of sublime accuracy as both teams combined for 0 – 11 from just 14 shots over a 16 minute spell (79% combined with an Expt Pts of +2.84). Kerry were the main contributors here scoring 0 – 06 from just the six shots (Expt Pts of +1.99) with Geaney hitting three from play. Dublin thus scored 0 – 05 from 8 shots and whilst they did not quite attain Kerry’s level of accuracy it was still above expected (Expt Pts +0.85). So up until the goal Dublin were well on top in the shot count – 17 to Kerry’s 8 – but Kerry’s accuracy was keeping them within reach. But it wasn’t just in terms of shots that Dublin were ahead. 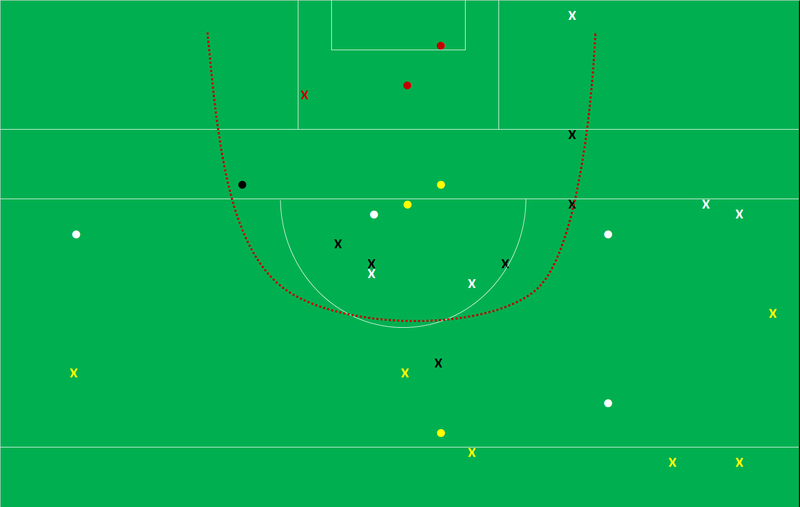 They had 28 possessions & 20 attacks (71% Attack Rate) to Kerry’s 20 possessions and just 9 attacks (45% Attack Rate). Kerry were being consumed. The extra possessions came from Dublin’s success on Kerry’s kickouts. Dublin had six kickouts prior to the first goal winning all six. Kerry had 14 kickouts but only managed to win seven with three of those going short. So when the Kerry kickout became contestable Dublin were 7 – 4 ahead. Dublin winning the opposition’s kickouts is not that much of a surprise any more however Kerry refused to help themselves here. There was no variation – all 11 were directed at either Moran or Maher and all went mid-range between the 20 and 45metre lines. Fenton, MacAuley & Kilkenny in particular had a field day. And what of Kerry’s anaemic attack? Yes their forwards were (extremely) economic scoring 0-06 from nine attacks (Dublin were 0-09 from 20) but to only manufacture nine attacks? A lot of this can be attributed to the plan Kerry employed early with long balls being sent in to Colm Cooper & Donaghy. They were getting some success but not enough were sticking and Johnny Cooper can take a lot of the credit for this. He was immense in this period breaking five such balls away from both (two from Donaghy & three from Colm Cooper). As the numbers from above show Dublin were absolutely rattled going in at half time. They had dominated the game for 30 minutes but had come undone under a deluge of Kerry counter punches. What happened next says a lot about where this Dublin team are at. They came out in the second half and didn’t panic. They just continued on in the same vein that allowed them to dominate the first 30 minutes. Within 14 minutes of the restart they were back level. Again the “volume” pressure began to tell. In those opening 14 minutes the shot count was 8 – 3 in Dublin’s favour. This time it was Dublin who were deadly accurate scoring 0 – 06 from those eight shots (Expt Pts +1.47). Dean Rock had a great game (0 -12 from 13 shots including two 45s and two from play) but he was particularly good in this period scoring 0 – 04 (including a 45 & one from play) as well as providing an assist for Fenton’s equaliser. Kerry’s earlier efficiency failed them here with the only point they scored coming from a Cooper free whilst he also dropped one short off his left into Cluxton’s hands. One thing that did change here was the possession pattern. For those opening 14 minutes Kerry were “only” 11-9 down in terms of possessions. The reason being that they started to change their kickouts to shorter ones. In that opening period Kerry had seven kickouts with four going short (Dublin did still win the “contestable ones 2-1). Dublin only had the two kickouts in this period winning both – interestingly neither went short! To all intents & purposes Kerry looked done. They had now played the guts of 50 minutes and had been comprehensively outplayed for 40. To their eternal credit they were far from done however. Around the time of Fenton’s equaliser Kerry introduced BJ Keane, James O’Donoghue and Brian O’Beaglaoich within five minutes of each other. 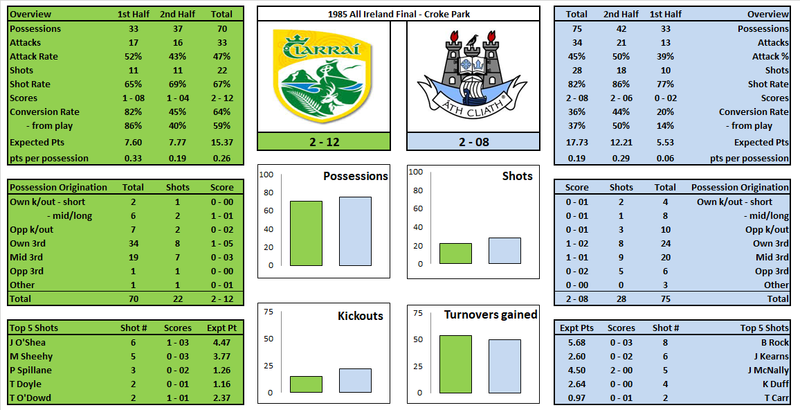 The freshness – or just their innate obdurateness – saw them wrestle control back manufacturing 0 – 03 from five shots in ten minutes whilst Dublin went into their shell somewhat managing just two wides (an ill-advised long range attempt from Byrne and Rock’s only miss of the game) from a relatively paltry five possessions. Initially there were 20 possessions in the opening 14 minutes of the half but this slowed to 11 in the next 11 minutes. The game slowed right down and it suited Kerry. And then we had the last 15 minutes within which Dublin were frankly superb. They had nine possessions in this period, excluding the final one after Kilkenny got thrown to the ground, progressing all nine inside Kerry’s 45 and getting eight shots off scoring 0 – 07. Under the most intense pressure, starting the period three points down, they produced an 89% Shot Rate and an 88% Conversion Rate with an Expt Pts of +2.17. Just outstanding. Kerry had their opportunities. They too had nine possessions in this period progressing seven inside Dublin’s 45 however they only produced four shots (57% Conversion Rate) with only one of those coming inside the final ~12 minutes. 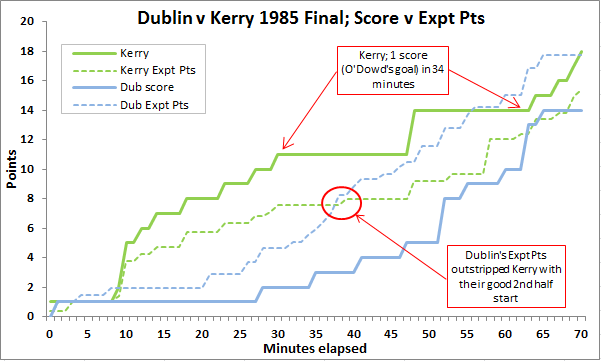 We will probably never know what led to such a diversion in those final 15 minutes – be it mental fortitude or the age profile of the teams finally catching up on Kerry – but what we can say is that this Dublin team answered every question about their resolve, ability and just fundamental skills in that final period. Over 70 minutes (or ~75 these days) that’s a paddlin’. With a full complement of players you are liable to mental and physical fatigue having ~10 less possessions going into the last ten minutes. You just cannot afford to go a man down against Dublin given the pace at which they play the game. I’m not sure there’s any benefit to be had looking at the game as a whole. Dublin ran riot in the last ten minutes attempting seven shots and scoring 2-03. But the demarcation point was probably the red card ten minutes earlier in the 50th minute. At that stage the score was 0-13 to 0-11 and whilst Dublin were on top it was still competitive. To that end below are the numbers up until the red card. Dublin had more possessions and were finding it easier to get the ball inside Kerry’s 45 (83% Attack rate to Kerry’s very poor 57%). More possession and a higher attack rate will naturally lead to more shots. One crumb of comfort for Kerry is that once inside the 45 they were producing more shots (73% Shot rate to Dublin’s 69%). One reason for this higher shot rate is the range that Kerry were shooting from. In the period up to the red card Dublin had 17 point attempts from play and all bar two were within ~30 metres of goal. Dublin were working the ball in close attempting higher percentage shots. Hence why on a 59% (13 scores from 22 shots)Success Rate they were only ~1pt above Expected. Kerry on the other hand were taking much harder shots but were converting them at a very high rate as evidenced by the Success Rate of 69% (11 from 16) and an ExpPts of +2.89. 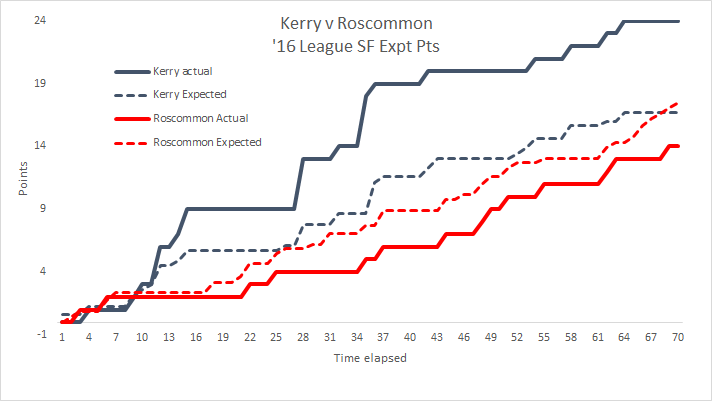 Reviewing the semi-final win over Roscommon I was interested to see whether the fast, accurate start Kerry had produced there, and against Cork, could be repeated. The accuracy was – they only missed two shots from play in the first half with one of them being Marc O’Sé’s attempt in the first minute. The speed however wasn’t. They need to be taking more shots, or get a goal, to keep up with Dublin. Re goal attempts; Darran O’Sullivan’s left footed effort after 22 minutes was the only one Kerry have managed across the last two finals (here & the All Ireland final in September). Dublin had four in the All Ireland final and one up until the red card here. Granted they didn’t convert any but if/when they meet again the goal attempts cannot be 5 -1 in Dublin’s favour. They will eventually convert! Speaking of converting – Bernard Brogan had an ominously good day. Prior to 2015 his returns from play were well below what was required for a forward of his calibre (combined ExptPts of -4.78 over the three years) but with the burden of the free taking duties removed he exploded on the 2015 Championship with an ExpPts return of +14.26 across 38 shots. As his shot chart above shows he played much closer to goal in 2015. He did the same here scoring four points from his four shots and setting up both goals. Dublin are not short of options up front but they may not need to exercise them if Brogan maintains his 2015 form. As ever with Dublin games the kickouts were a focus for a lot of the build-up. Kerry had some success here in the All Ireland final getting their hands on three of Cluxton’s ten short kickouts and the expectation was that they were going to do a similar “press” here. No such luck. Dublin dominated their own kickout winning 89% (16 of 18). More tellingly they managed to score 0-07 directly from those 16 possessions. When discussing the kickouts pre game a lot of focus is on the Dublin kickout but little emphasis is placed on just how good they are on the opposition’s kickout. Here Kerry went past the 45m line (were forced to go past?) on 19 kickouts winning the possession battle 11-8. Despite this supremacy they only scored 0 – 02 from these possessions whilst Dublin managed to produce 0 – 04 from the 8 kickouts they won. Dublin dominated their own kickouts with a net return of 0 – 06 (Kerry managed 0 – 01 from the two Dublin kickouts they won) and had a net return of 0 – 02 off Kerry’s contestable kickouts. That’s 0 – 08 to the good on kickouts alone without mentioning the goal. Kickouts going askew are a natural hazard of using short routines. The idea is that over time you will gain more from the 95% successful short kickouts than you will lose from the 5% that go wrong. That is fine in a macro sense however over 70 minutes one going wrong can be devastating and with the frequency of short kickouts increasing we are seeing more and more erroneous ones being punished to the full. Donegal in the 2014 All Ireland final, Roscommon at the end of their first Division one game against Monaghan and now this. All punished by clinical forwards. Kealy’s kickout wasn’t the first to go wrong. It won’t be the last. Although the 70 minute overview doesn’t read too badly for Roscommon this game was over by the 18th minute when they were attempting just their fifth shot. The gulf is probably better represented by the below comparison. By the time of that fifth shot Kerry had scored 1-06 from their opening ten shots. Almost as impressive as that strike rate is how they killed the game instantly inside three minutes. Cooper bagged his goal with an excellent finish from the left of the small square. Kerry then went on to win the next three Roscommon kickouts scoring a point off each. Roscommon went in to the 12th minute 0-03 to 0-02 down and emerged in the 16th minute 1-06 to 0-02 down with their only possession of the ball being 3 goal kicks. Absolutely clinical. Not all of Kerry’s league games were televised but this is not the first time we have seen them sprint out of the traps this year. Against Cork, by the 20th minute, they bagged 0-10 from their opening 12 shots killing that game off too. It will be interesting to see how they start against Dublin in the final. Speaking of that final what may also be illuminating is the kickout battle. Michael Quirke had a good article in the Examiner during the week stating that Down, Donegal, Cork & Kerry won just five of Dublin’s kickouts combined. Now we can argue the merit of that stat (did those teams push up? How many were short & thus uncontested?) but the crux of the article is that Cluxton is a potent weapon for Dublin. I think on that we can all agree. And yet in the All Ireland final Kerry managed to seriously pressure Cluxton winning three of their ten short kickouts (unheard of previously) whilst Mayo also managed to break down the kickout routine at the end of the drawn replay. On the other hand Kerry might be worried about their own kickouts. In that final Dublin lorded it over them in the second half until that dominance forced Kerry to go short in the last quarter. Here Roscommon got their hands on 60% (12 of 20) of Kerry’s contestable kickouts. Granted that return was aided by Roscommon winning five of the last six Kerry kickouts. It could be argued that Kerry had switched off towards the end whilst Roscommon were still working trying to eek something from what was to that point an excellent league campaign (& still is). But even still prior to this the count was seven apiece on contestable kickouts. Their shooting was poor here. Not necessarily the shot selection but the execution with some very simple chances missed in the first half. Scoreboard pressure after Kerry’s early onslaught? Or something else? Looking at the four (vs Monaghan, Donegal & Kerry twice) league games charted Roscommon attempted 102 shots scoring 2 – 56. This is against an Expected Return of ~63 points. That’s not a bad return at all when you consider the weather and pitch conditions (the Expt Pt is modelled on Championship games) and the fact that they were stepping up in regards the quality of opposition. It would appear from this distance that there is no glaring issue with their shooting. Another element that stands out on the above chart is just how clean in front of the goal is. Kerry managed to stop Roscommon having any shots at goal. 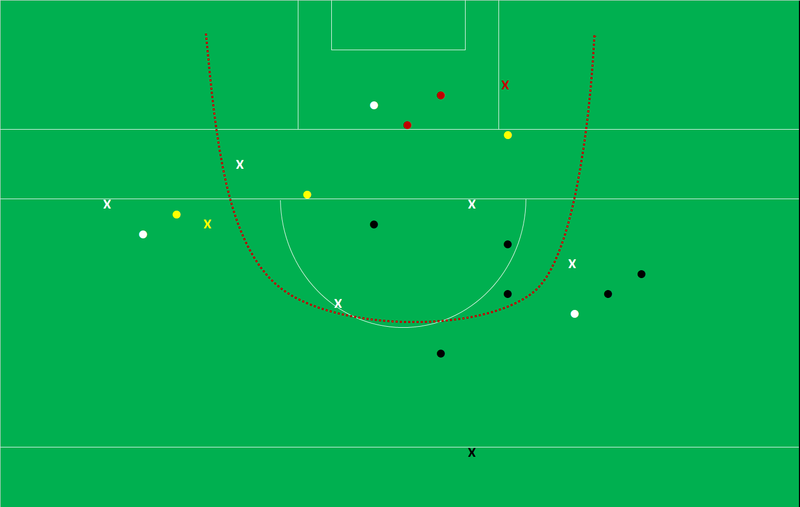 In the other three games Roscommon manufactured five shots at goal scoring 2-02. Not exactly prolific and perhaps one area they can take away to work on. One final point to note on Roscommon is their short kickout routine. Short kickouts going astray is an occupational hazard for teams that employ the tactic but it was a short kickout that effectively cost them the game late on versus Monaghan and here again they found a Kerry man wiiiide open inside their own 45 on a short one (different keepers on both occasions). This doesn’t count the numerous instances that I visibly winced as a defender received the ball with the attackers bearing down on him. Short kickouts are fine – and will go astray – but Roscommon seem to flirt with danger more than most.